Toronto: Pubic/private-sector collaboration and a shared vision deliver CPR to a once-blighted square, and offers a lesson in successfully blurring the lines between the two. Urban renewal has become a critical issue because most alternatives have proven disastrous. A dystopian view of a dehumanized urban environment is best expressed in Ridley Scott’s film, “Blade Runner.” It depicts a futuristic landscape where sprawl, blight, and class hierarchy interface with towering structures to illustrate a model of failed humanistic urbanism. Inhabitants without public interactive space experience the resultant alienation and criminal eruptions of a population trapped in surroundings designed to create hopelessness. Contemporary reality has not reached such epic proportions due mainly to the realization that urban design and healthful living are interdependent. Historically, city centers – frequently city squares – have been the intersection of commerce, culture, politics, and social interchange. When lost, a city can lose its life force. With many of Modernism’s failed experiments as lessons to avoid in terms of planning (think Pruitt-Igoe as a famous example), strategists are going back and revisiting a more humanistic approach to urban development. In Toronto, the evolution of such a process has resulted in a rather dramatic streetscape change on the corner of Yonge Street and Dundas Square – an area often described throughout the 1990s as failed urbanism, known for crime, littered with a collection of low-end stores, and anchored by the Eaton Centre, which turned its back to the street. Like many aging inner cities, the area had lost its lifeblood. It suffered budget cuts and reduced tax revenue from an exodus to the “burbs” that blighted its once-vital signs. 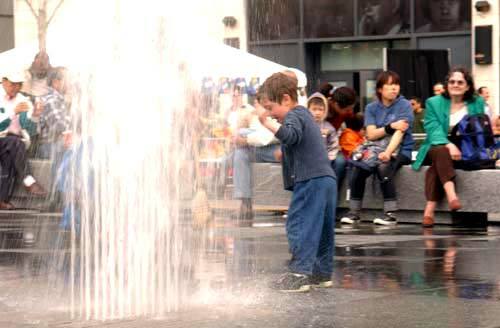 In 1998, the City of Toronto, supported by local businesses, launched a design competition. The award-winning Yonge-Dundas Square, designed by Brown + Storey Architects and completed in 2002, forms the blueprint for the regeneration of the area. Intended to be the “Times Square” of Toronto, the public space occupies a city block on top of a 270-car public parking facility with access to public transit. It is a connection to and focal point of surrounding rehabilitated shopping, entertainment, and tourist venues. The Square includes the Toronto Theatre Alliance’s T.O. TIX booth, a 30-by-60-foot raised stage, 20 lively computer-programmed water features, large granite slabs creating inviting gathering areas, and a diagonal zinc canopy demarking the southern edge. The project has instigated a regeneration of the Yonge Street corridor. Businesses have embraced the initiative, often crediting the “commercial venture” of its management as the primary reason for its success. James L. Robinson, Executive Director of the Downtown Yonge Business Improvement Area, says it is inspiring ripple effects beyond the square: “The business community has been extremely supportive of the regeneration program… In the immediate area, properties have been renovated and redeveloped to take advantage of the Square, which has created one of the most high-profile locations in Toronto. This miracle on Yonge Street is the result of a successful collaboration of public and private funding. It is a reversal of a trend in recent decades when suburban developers replicated city centers with open public space and profitable malls while inner cities withered without tax revenues or tactical commitment. A century ago, cities saw an unprecedented growth in public space. Parks and open areas were a priority on all urban agendas and one never questioned the future of public space. What has happened is symptomatic of a decline in the level of services once provided by government agencies. As government has lessened its grip on social services, significant strides have been made with partnerships between public agencies and the private and not-for-profit sectors. The Business Improvement Districts (BIDs), which first emerged in the U.S. during the 1960s, represent publicly endorsed but privately run organizations. They serve to financially complement public services once provided solely by the government. The BID’s scope of business usually includes improving outdoor public spaces as well as marketing campaigns and outreach services to draw residents and visitors. Financing is derived from self-taxing measures that generate revenue from participating neighborhood properties. However, no one can deny that this radical resuscitation resulted from efforts by the local government and private business interests. 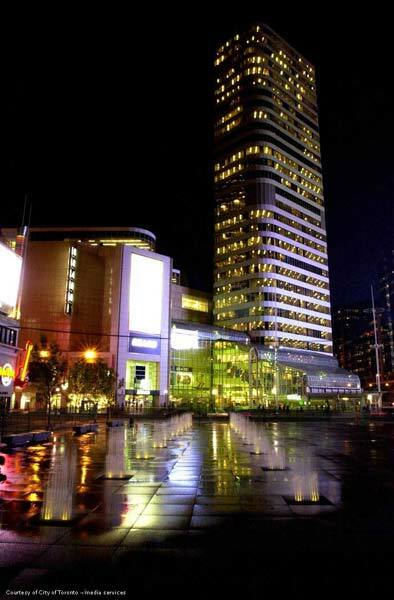 Since Downtown Yonge B.I.A.’s founding, new initiatives and wide participation have made this inner city the “in place,” a magnet for Toronto’s residents and tourists. There are now additional police patrolling the area, and clean streets teams provide services beyond those of the city, including graffiti and poster removal, sidewalk washing, and additional street sweeping. 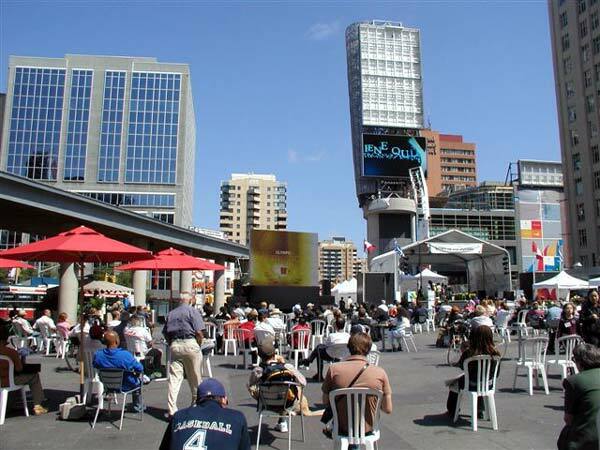 Yonge-Dundas Square represents a current trend in the way public space is being conceptualized throughout the world. Once disparate public and private enterprises are now finding the lines blurred between their traditional roles. These symbiotic relationships that rely on each other’s strengths promise a new prognosis for deteriorating inner cities everywhere. With degrees in both architecture and engineering, Effie Bouras, Assoc. AIA, has worked on a number of building projects throughout North America. She is currently pursuing a Ph.D. in Urban Design at Arizona State University College of Design, while continuing to write and collaborate with designers on building projects. Most recently, her drawings were in a group show at the San Antonio International Airport, and she collaborated on the sound installation, "Dark Space," at the Contemporary Arts Collective in Las Vegas. A conversation with the architect at the forefront of moving modular prefab (and green) houses into the mainstream. Toronto: The art and science of architecture fuse to create poetry of form. Before: typical streetscape of the Yonge-Dundas intersection in downtown Toronto – an amalgamation of crime, little planning, and hardscape. After: view of shading canopy, electronic media bulletin, and fountains; Eaton Centre entrance in background to the left. Film screening during a summer festival.